Akbar's tomb is the tomb of the Mughal emperor, Akbar and an important Mughal architectural masterpiece. 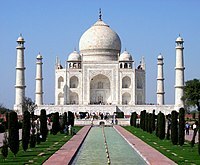 It was built in 1604–1613 and is situated in 119 acres of grounds in Sikandra, a sub of Agra, Uttar Pradesh, India. As Viceroy of India, George Curzon directed extensive repairs and restoration of Akbar's mausoleum, which were completed in 1905. Curzon discussed restoration of the mausoleum and other historical buildings in Agra in connection with the passage of the Ancient Monuments Preservation Act in 1904, when he described the project as "an offering of reverence to the past and a gift of recovered beauty to the future". This preservation project may have discouraged veneration of the mausoleum by pilgrims and people living nearby. It is located at Sikandra, in the suburbs of Agra, on the Mathura road (NH2), 8 km west-northwest of the city center. About 1 km away from the tomb, lies Mariam's Tomb, the tomb of Mariam-uz-Zamani, wife of the Mughal Emperor Akbar and the mother of Jahangir. The south gate is the largest, with four white marble chhatri-topped minarets which are similar to (and pre-date) those of the Taj Mahal, and is the normal point of entry to the tomb. The tomb itself is surrounded by a walled enclosure 105 m square. The tomb building is a four-tiered pyramid, surmounted by a marble pavilion containing the false tomb. The true tomb, as in other mausoleums, is in the basement. The buildings are constructed mainly from a deep red sandstone, enriched with features in white marble. Decorated inlaid panels of these materials and a black slate adorn the tomb and the main gatehouse. Panel designs are geometric, floral and calligraphic, and prefigure the more complex and subtle designs later incorporated in Itmad-ud-Daulah's Tomb. Main entrance of Akbar's Tomb complex from inside. Calligraphy over the entrance to the main burial chamber. True tomb of Akbar, at the basement of the tomb. Kanch Mahal, built by Jehangir, as a harem quarter later used as a hunting lodge. ^ Vīrasiṃha, 2006, "The Jats: Their Role & Contribution to the Socio-economic Life and Polity of North & North-west India, Volume 2", University of Michigan, Page 100-102. ^ Edward James Rap;son, Sir Wolseley Haig and Sir Richard, 1937, "The Cambridge History of India", Cambridge University Press, Volume 4, pp.305. ^ Waldemar Hansen, 1986, "The Peacock Throne: The Drama of Mogul India", Page 454. ^ Reddy, 2005, "General Studies History for UPSC", Tata McGraw-Hill, Page B-46. ^ Catherine Blanshard Asher, Catherine Ella Blanshard Asher, 1992, "Architecture of Mughal India - Part 1", Cambridge university Press, Volume 4, Page 108. ^ Rajagopalan, Mrinalini (Summer 2011). "From loot to trophy: the vexed history of architectural heritage in imperial India" (PDF). International Institute for Asian Studies. Retrieved 3 January 2019. ^ "Remembering the Great Emperor". The Hindu. 27 October 2003. ^ "Fascinating monuments, timeless tales". The Hindu. Chennai, India. 22 September 2003. ^ Akbar's Tomb Archived 2010-06-19 at the Wayback Machine Archnet.org. ^ Akbar's Tomb Architecture of Mughal India, Part 1, Volume 4, by Catherine Ella Blanshard Asher. Cambridge University Press, 1992. ISBN 0-521-26728-5. p. 107. Keene, Henry George (1899). "Sikandra". A Handbook for Visitors to Agra and Its Neighbourhood (6 ed.). Thacker, Spink & Co. p. 43. Havell, Ernest Binfield (1904). "Sikandra". A Handbook to Agra and the Taj, Sikandra, Fatehpur-Sikri, and the Neighbourhood. Longmans, Green & Co., London. This page was last edited on 7 April 2019, at 04:40 (UTC).